WTI Crude oil entered in a phase of bullish consolidation as the supply risk from Iran outweighs the Saudi oil production boost. The bulls are currently taking a breather before taking another attempt and try to break above the recent highs. Moreover, the price of WTI also ignored broad-based US Dollar strength which usually makes the USD-denominated oil more expensive to the foreigner . After retreating a bit below the $72 level during yesterday's session, Crude oil has picked up strong momentum and prices are up and set to retest the recent highs at $72.7 per barrel. 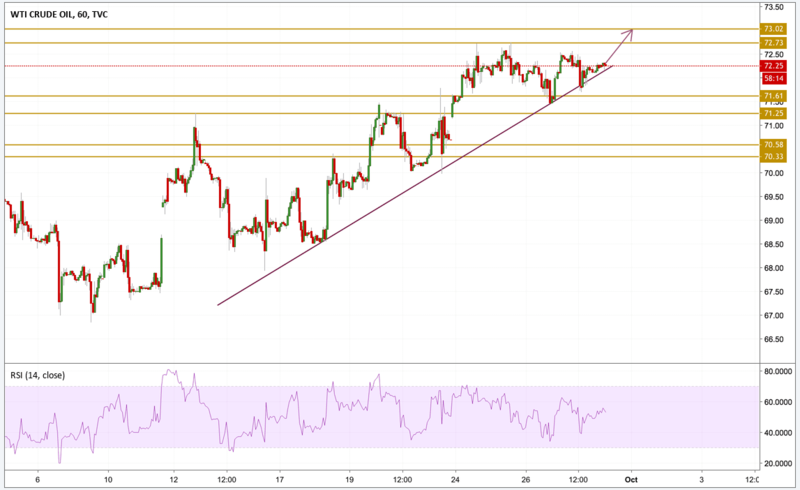 The purple trend line presented on the chart continues to support the price and we expect to see some new highs printed before we enter into an overbought state, that is why we will be focusing on the $73 resistance level.